Incoterms® is an abbreviation for the international commercial terms and is the registered trademark name given to these terms by International Chamber of Commerce (ICC). They are a series of three-letter trade terms related to common contractual sales practices. The Incoterms® rules are intended primarily to clearly communicate the tasks, costs, and risks associated with the transportation and delivery of goods. They are published by the ICC and are widely used in international commercial transactions. Incoterms® are a set of rules which define the responsibilities of sellers and buyers for the delivery of goods under sales contracts for domestic and international trade. They apportion transportation costs and responsibilities associated with the delivery of goods between buyers (importers) and sellers (exporters) and reflect modern day transportation practices. 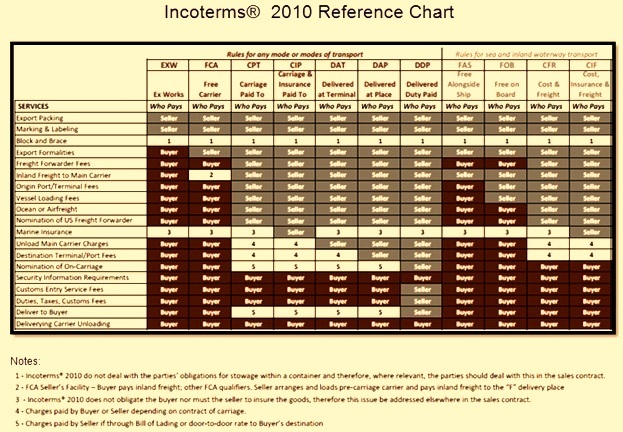 Incoterms® significantly reduce misunderstandings among trading parties and thereby minimize trade disputes and litigation. The Incoterms® was first conceived by ICC in 1921, and brought to fruition with the first Incoterms® rules in 1936. The Incoterms® were created with the purpose of providing a set of international rules for the interpretation of the most commonly used trade terms in foreign trade. A Trade Terms Committee with the assistance of the ICC National Committees developed the first six rules in 1923 namely FOB, FAS, FOT, FOR, Free Delivered CIF and C&F, which were the precursor of what would later be known as the Incoterms® rules. This set in motion a long and vibrant history of Incoterms® rules. As commercial practices, types of goods and transports, and international laws evolve, the Incoterms ® rules need to be regularly updated by experienced international experts. Since the issue of first set of rules in 1936, ICC expert lawyers and trade practitioners have updated them six times to keep pace with the development of international trade. The latest version that continues today is Incoterms® 2010. Launched in mid-September 2010, Incoterms® 2010 came into effect on 1 January 2011. These rules help the contracting parties to avoid costly misunderstandings by clarifying the tasks, costs and risks involved in the delivery of goods from sellers to buyers. Incoterms® rules are recognized by United Nation Commission on International Trade Laws (UNCITRAL) as the global standard for the interpretation of the most common terms in foreign trade. The number of Incoterms® rules has been reduced from 13 to 11. This has been achieved by substituting two new rules that may be used irrespective of the agreed mode of transport – DAT, Delivered at Terminal, and DAP, Delivered at Place – for the Incoterms® 2000 rules DAF, DES, DEQ and DDU. Under both new rules, delivery occurs at a named destination: in DAT, at the buyer’s disposal unloaded from the arriving vehicle (as under the former DEQ rule); in DAP, likewise at the buyer’s disposal, but ready for unloading (as under the former DAF, DES and DDU rules). The new rules make the Incoterms® 2000 rules DES and DEQ superfluous. The named terminal in DAT may well be in a port, and DAT can therefore safely be used in cases where the Incoterms® 2000 rule DEQ once was. Likewise, the arriving ‘vehicle’, under DAP may well be a ship and the named place of destination may well be a port: consequently, DAP can safely be used in cases where the Incoterms® 2000 rule DES once was. These new rules, like their predecessors, are ‘delivered’, with the seller bearing all the costs (other than those related to import clearance, where applicable) and risks involved in bringing the goods to the named place of destination. The 11 Incoterms® 2010 rules are now organized by modes of transport. Used in international as well as in domestic contracts for the first time, the new groups aim to simplify the drafting of contracts and help avoid misunderstandings by clearly stipulating the obligations of buyers and sellers. The two distinct groups are (i) rules for any mode or modes of transport, and (ii) rules for sea and inland waterway transport. The first group includes the seven Incoterms® 2010 rules that can be used irrespective of the mode of transport selected and irrespective of whether one or more than one mode of transport is employed. EXW, FCA, CPT, CIP, DAT, DAP and DDP belong to this group. They can be used even when there is no maritime transport at all. It is important to remember, however, that these rules can be used in cases where a ship is used for part of the carriage. In the second group of Incoterms® 2010 rules, the point of delivery and the place to which the goods are carried to the buyer are both ports, hence the label ‘sea and inland waterway’ rules. FAS, FOB, CFR and CIF belong to this class. Under the last three Incoterms rules, all mention of the ship’s rail as the point of delivery has been omitted in preference for the goods being delivered when they are ‘on board’ the vessel. This more closely reflects modern commercial reality and avoids the rather dated image of the risk swinging to and fro across an imaginary perpendicular line. EXW Ex Works – ‘Ex Works’ means that the seller delivers when it places the goods at the disposal of the buyer at the seller’s premises or at another named place (i.e. works, factory, warehouse, etc.). The seller does not need to load the goods on any collecting vehicle, nor does it need to clear the goods for export, where such clearance is applicable. FCA Free Carrier – ‘Free Carrier’ means that the seller delivers the goods to the carrier or another person nominated by the buyer at the seller’s premises or another named place. The parties are well advised to specify as clearly as possible the point within the named place of delivery, as the risk passes to the buyer at that point. CPT Carriage Paid To – ‘Carriage Paid To’ means that the seller delivers the goods to the carrier or another person nominated by the seller at an agreed place (if any such place is agreed between parties) and that the seller must contract for and pay the costs of carriage necessary to bring the goods to the named place of destination. DAT Delivered At Terminal – ‘Delivered at Terminal’ means that the seller delivers when the goods, once unloaded from the arriving means of transport, are placed at the disposal of the buyer at a named terminal at the named port or place of destination. “Terminal” includes a place, whether covered or not, such as a quay, warehouse, container yard or road, rail or air cargo terminal. The seller bears all risks involved in bringing the goods to and unloading them at the terminal at the named port or place of destination. DAP Delivered At Place – ‘Delivered at Place’ means that the seller delivers when the goods are placed at the disposal of the buyer on the arriving means of transport ready for unloading at the named place of destination. The seller bears all risks involved in bringing the goods to the named place. DDP Delivered Duty Paid – ‘Delivered Duty Paid’ means that the seller delivers the goods when the goods are placed at the disposal of the buyer, cleared for import on the arriving means of transport ready for unloading at the named place of destination. The seller bears all the costs and risks involved in bringing the goods to the place of destination and has an obligation to clear the goods not only for export but also for import, to pay any duty for both export and import and to carry out all customs formalities. FAS Free Alongside Ship – ‘Free Alongside Ship’ means that the seller delivers when the goods are placed alongside the vessel (e.g., on a quay or a barge) nominated by the buyer at the named port of shipment. The risk of loss of or damage to the goods passes when the goods are alongside the ship, and the buyer bears all costs from that moment onwards. FOB Free On Board – ‘Free On Board’ means that the seller delivers the goods on board the vessel nominated by the buyer at the named port of shipment or procures the goods already so delivered. The risk of loss of or damage to the goods passes when the goods are on board the vessel, and the buyer bears all costs from that moment onwards. CFR Cost and Freight – ‘Cost and Freight’ means that the seller delivers the goods on board the vessel or procures the goods already so delivered. The risk of loss of or damage to the goods passes when the goods are on board the vessel. the seller must contract for and pay the costs and freight necessary to bring the goods to the named port of destination. Incoterms® rules have traditionally been used in international sale contracts where goods pass across national borders. In various areas of the world, however, trade blocs, like the European Union, have made border formalities between different countries less significant. Consequently, the subtitle of the Incoterms® 2010 rules formally recognizes that they are available for application to both international and domestic sale contracts. As a result, the Incoterms® 2010 rules clearly state in a number of places that the obligation to comply with export/import formalities exists only where applicable. Two developments have persuaded the ICC that a movement in this direction is timely. Firstly, traders commonly use Incoterms® rules for purely domestic sale contracts. The second reason is the greater willingness in the United States to use Incoterms® rules in domestic trade rather than the former Uniform Commercial Code shipment and delivery terms. Before each Incoterms® 2010 rule there is a Guidance Note. The Guidance Notes explain the fundamentals of each Incoterms® rule, such as when it should be used, when risk passes, and how costs are allocated between seller and buyer. The Guidance Notes are not part of the actual Incoterms® 2010 rules, but are intended to help the user accurately and efficiently steer towards the appropriate Incoterms® rule for a particular transaction. Previous versions of Incoterms® rules have specified those documents that could be replaced by EDI (electronic data interchange) messages. Articles A1/B1 of the Incoterms® 2010 rules, however, now give electronic means of communication the same effect as paper communication, as long as the parties so agree or where customary. This formulation facilitates the evolution of new electronic procedures throughout the lifetime of the Incoterms® 2010 rules. The Incoterms® 2010 rules are the first version of the Incoterms® rules since the revision of the Institute Cargo Clauses and take account of alterations made to those clauses. The Incoterms® 2010 rules place information duties relating to insurance in articles A3/B3, which deal with contracts of carriage and insurance. These provisions have been moved from the more generic articles found in articles A10/B10 of the Incoterms® 2000 rules. The language in articles A3/B3 relating to insurance has also been altered with a view to clarifying the parties’ obligations in this regard. There is heightened concern nowadays about security in the movement of goods, requiring verification that the goods do not pose a threat to life or property for reasons other than their inherent nature. Therefore, the Incoterms® 2010 rules have allocated obligations between the buyer and seller to obtain or to render assistance in obtaining security-related clearances, such as chain-of-custody information, in articles A2/B2 and A10/B10 of various Incoterms® rules. Under Incoterms® rules CPT, CIP, CFR, CIF, DAT, DAP, and DDP, the seller must make arrangements for the carriage of the goods to the agreed destination. While the freight is paid by the seller, it is actually paid for by the buyer as freight costs are normally included by the seller in the total selling price. The carriage costs will sometimes include the costs of handling and moving the goods within port or container terminal facilities and the carrier or terminal operator may well charge these costs to the buyer who receives the goods. In these circumstances, the buyer will want to avoid paying for the same service twice: once to the seller as part of the total selling price and once independently to the carrier or the terminal operator. The Incoterms® 2010 rules seek to avoid this happening by clearly allocating such costs in articles A6/B6 of the relevant Incoterms rules. In the sale of commodities, as opposed to the sale of manufactured goods, cargo is frequently sold several times during transit “down a string”. When this happens, a seller in the middle of the string does not ‘ship’ the goods because these have already been shipped by the first seller in the string. The seller in the middle of the string therefore performs its obligations towards its buyer not by shipping the goods, but by ‘procuring’ goods that have been shipped. For clarification purposes, Incoterms® 2010 rules include the obligation to ‘procure goods shipped’ as an alternative to the obligation to ship goods in the relevant Incoterms rules. The responsibilities of buyers and sellers are summarized in reference chart given in Fig 1.